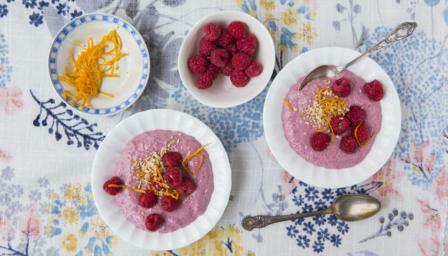 This creamy, nutty chilled dessert is low in sugar, getting its sweetness from raspberries, coconut and stevia. This dessert provides 575 kcal, 7g protein, 22g carbohydrate (of which 11.5g sugars), 52g fat (of which 32g saturates), 12g fibre and 0.1g salt per portion. Blend the crème fraîche with the chia seeds, vanilla extract, honey, raspberries (reserving a handful of the raspberries for the garnish) and salt until smooth and well combined. Add the stevia, taking care to taste after each drop as stevia is very sweet. Chill the chia mixture in the fridge for at least 4 hours, or preferably overnight. To serve, divide the chia pudding equally among 4 serving bowls. Garnish with the reserved raspberries, toasted nuts and orange zest.